The Artisan Chocolate Fair of Florence has been for years a landmark for chocolate producers and lovers, today it has become one of the most important and complete exhibitions for Italian and foreign chocolate masters. 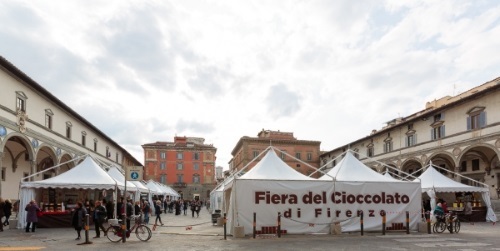 In 2019 the Chocolate Fair will take place with a new look and a new name to underline the fact that, after 15 editions, Florence and Chocolate are now inseparable: 'Florence and Chocolate' is in fact the name chosen for this fair! Chocolate Exhibitors and Artisans from all over the world will present a great variety of chocolate and delicacies, as a result of tradition and experience, to delight the view and above all the palate of all visitors. This fair 15th edition will be full of events, activities, celebrities and renowned chefs as never before. Loggiato dei Serviti is a Charming Hotel in Piazza SS. Annunziata, which is the venue of the Florence and Chocolate fair from 8 to 17 February, 2019: one more sweet reason to choose us for your stay in Florence!